Welcome to North Lake Middle School. The curriculum in 7th & 8th grade is delineated by content area. We have strong programming in the four main content areas of: Mathematics, ELA (English Language Arts), Science, and Social Studies. Our scope and sequence is aligned to the Common Core State Standards in Mathematics and ELA and the Wisconsin State Standards in Science and Social Studies. Our team of middle school teachers collaborate on a daily basis and aim to integrate their classes when appropriate. A wonderful example is our participation in Junior Achievement’s Capstone Programming: Finance Park for 8th grade. Elective classes in 7th & 8th grade include: Band, Choir, Physical Education/Health, Art, Music Technology, Transitions, Literary Connections, and Spanish. North Lake School also offers the Project Lead the Way STEM curriculum: Gateway to Technology. Design and Modeling is an engineering class for seventh graders. Automation and Robotics is the eighth grade engineering offering. North Lake School’s curriculum culminates in 7th & 8th grade thus graduating great students who are well-prepared for the high school of their choice and can meet the college and career readiness standards outlined in the Common Core State Standards. Besides the regular classroom novels, seventh grade students are required to read at least one additional book each month. There are many book options as well as a variety of ways students may use to report and share their understanding and enjoyment of reading. As preparation for high school, eighth grade students are required to read at least one additional book each month beyond the novels assigned in class. A variety of books are offered which will challenge students to think about topics, issues, viewpoints, and situations new to them. A variety of oral and written reporting methods require students to demonstrate what they have learned from their reading. North Lake School’s sixth, seventh, and eighth grade math curriculum is BIG IDEAS MATH 2014. We are proud to offer this Common Core-built curriculum written by Ron Larson and Laurie Boswell, leaders in the field of mathematics. The Big Ideas Math is a three year middle school series taught at North Lake School. The program uses a research-based strategy of a balanced approach to instruction and has made this series very successful. This approach opens doors to abstract thought, reasoning, and inquiry as students persevere to answer the Essential Questions that drive instruction. The foundation of the program is the Common Core Standards for Mathematical Content and Standards for Mathematical Practice. This series exposes students to highly motivating and relevant problems that offer the depth and rigor needed for Calculus and future college level courses. The Big Ideas Math Algebra (Grade 8), the Red Accelerated book (Grade 7), and Green Big Ideas Math (Grade 6) complete the compacted pathway for North Lake school middle school students and their mathematical achievement. The study of science allows North Lake middle school students to experience the richness and excitement of the natural world. As adults, they will face complex questions requiring scientific thinking, reasoning, and the ability to make informed decisions. Scientific knowledge prepares students for the future and helps them acquire skills needed to hold meaningful and productive jobs. Students use the scientific method and are engaged in numerous high end experiments and laboratories throughout their seventh and eighth grade science classes. These hands-on learning experiences follow strong content instruction and finish with written lab reports and relevant classrooms assessments. Seventh grade Global Studies will focus on the Eastern World as a continuation of the 6th grade Western World content. Students will study the Eastern World from ancient to modern times with a platform of globalization throughout history. Students will gain unique perspectives of our interconnected and complex world as we explore the social issues, economic impacts, and political relationships and decisions of the Eastern World. Eighth grade Social Studies will focus on United States history, economics, geography, and political science. Students will begin by studying Ancient America and journey through history to finally explore the Civil War through Reconstruction and Industrialism. As we progress, we will continually keep in mind how our past affects our present. We will apply these key indicators to America’s future. Students will gain a deeper understanding of America’s role in this complex, global environment. We will also study civics and political systems with the goal of creating civically minded citizens. 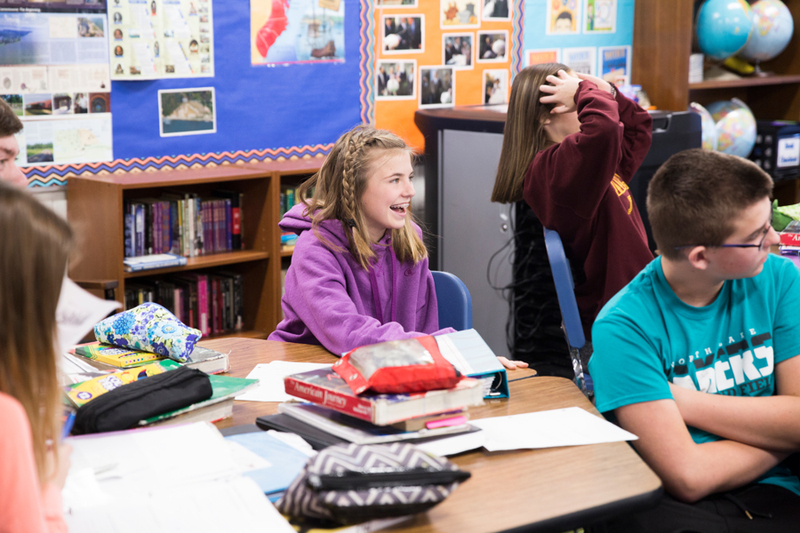 Daily foundations of Social Studies for both 7th and 8th grade will require students to think critically, develop inquiries, understand content, make connections, form arguments, gather and use evidence, and communicate conclusions effectively. Students will learn to think about the world using different perspectives and gain a deeper understanding through the use of disciplinary literacy including reading, writing, speaking, and listening. Finally, students will continue their use of organizational skills to ensure a smooth work flow throughout the year. We will apply all of these foundations as we begin our journey. Art will focus on creating and developing proficiencies in multiple mediums of visual art including, drawing, painting, clay, metal fabrication, photography, tech art, and many more. Automation and Robotics (8th Grade Only) focuses on creativity, collaboration, and problem solving to design and construct robotic mechanisms. Students will program the robots to function in a way to accomplish a given goal or purpose. Band emphasizes tonal and rhythmic development, performance skills, musical literacy, critical thinking, and creativity. Choir will focus on vocal development, harmonies, and performance skills. Design & Modeling (7th Grade Only) is a high-level engineering class created as an introductory offering preparing students for future Project Lead The Way classes. These students will learn and apply their skills on computer assisted drawing software called “Inventor” and build their models in our new engineering lab. Literary Connections (7th Grade Only) uses an integrated method to develop literacy skills. Course elements will focus on writing (both creative and “writing for work”), individual and group presentation skills and using technology to develop and exhibit original projects. Music Technology is a music production and sound engineering class. Students will learn about recording devices, sound waves, music theory, and how to create and layer their own music compositions and remixes through Axiom Midi Keyboards and computer programs used in the industry such as Audacity, Reason, and other music-making programs. PE/Health These classes are rooted in the state standards of PE and health. They focus on developing skills of lifetime wellness, fitness activities, team sports, and health concepts. Spanish is highly recommended for all students to take. Successful completion of 7th and 8th grade Spanish and passing the entrance exam in the spring of your 8th grade year will result in qualifying for Spanish 2 as a freshman at Arrowhead High School. Transitions is a personal life skills course which will prepare students for Arrowhead and beyond. The course will be composed of three sections addressing health and wellness, academic planning and career exploration, and financial literacy. Content will help prepare students for the management and organization skills required for high school.